Jan Slepcik, Romany man named Aco, an extraordinary guitarist and singer, dies not belong to quite unknown Romany musicians. In the first half of the 80s, he was invited, as a professional consultant, to co-operate with the Na Zábradlí theatre, where he was involved, namely, form the musical and choreographical point of view, un the staging preparation of "Noisy Solitude", Bohumil Hrabal`s play. 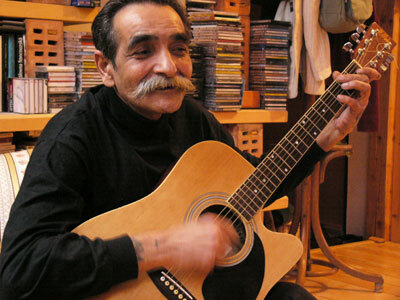 Altogether with Jirí Stivín, a jazzman, they have composed and recorded music to the "Tramp" film, Aco himself has had several productions on both radio and television. In 1990, he performed with Magda, his wife, on the first Romany Folk Festival in Brno, following years one could listen to and see them as they toured with concerts under the "Slepcík`s Duo" title in Innsbruck, Vienna and the festival "Fenêtre sur Prague" in Paris, where, except them, the "Czech" culture was also represented by Vera Bílá, a Romany singer. In 1999, Slepcík married couple performed as well on the second year of Ethnic and World Music`s Festival held by the Respect, a weekly periodical. Unfortunately, at that time Magda, his wife, was taken ill with severe disease and died suddenly. She left Aco alone with six children. His musical beginnings are tightly bound to Kosice, a "mother city" of Eastern Slovakia, where multiple influences of the Hungarian, Romany and Slovakian folk music interfered intensively at the tome of is youth. This was where, in the second half of the 60s, a major of old traditional Romany musicians still lived both in the city its surroundings, for them their music once used to be the mode of existence, even if its fame was gradual decline because of less and less demand for the folk music. One could say that Aco was growing up in crucial period. On one hand, the traditional Romany musical culture was still living so far, on the other hand, the influence of the modern pop-music, namely Anglo-Saxonian one, proliferated more and more. The Beatles were here and a new musical era coming along. Electric guitars and percussions (drums) become the chief musical instruments. This style striked a young Romany generation as well, and as luck would have it, a very first song Aco learned was just from Beatles. Modern Romany bands were emerging. Aco set up one of such bands, "Terne chave" ("Youngsters"), at the age of fourteen with his friends. Apart form imitating compositions of foreign groups, they also composed their own songs. Some of them are still popular and played up to now (e. g., No. : "Mandar hin" or No. : 15 "Balvaj phurdel"). These songs were often based on melodies that were assumed from the popular music, and the "Terne chave" modified them in their own way and in Romany spirit. They returned back to traditional Romany songs at the same time. The ability to play czardas or halgató with the correct chords, rhythm and execution was the question of a musician`s honour. Aco still remains a brilliant performer of both styles that prevail in the Romany music so far; he succeeds to perform masterfully either the phurikane giza, i. e. old songc or the neve giza, i . e. new songs. Contrastedly to a very accurate style purity, with which he performs the traditional Romany songs (numbers:1, 2, 14, 17, 18, 21 on the CD), his way of playing the new Romany songs is influenced to some extent by pop, rock, Romany jazz (for example No. :8, 10, 20) and folk. However, apart from being only a performer of songs, Jan Slepcik is a composer of his own songs as well (No. : 3, 5, 6, 7, 9, 11, 13, 19). Some of them have become popular (for example, No. : 6, 11), some others have fallen into so deep oblivion that even their author himself hardly remembers them, if reminded to him. Sometimes one can find it difficult to keep up any exact dividing line between his own facture and adopted songs, because he often modifies words or creates his own arrangements that may be very distant from the original (for example: No. : 8, 16). However, what all Aco`s songs have common is that they have sprung from a personal experience to remain on the way of his life like imaginary milestones. Also in section "Romany Music"